Day eight of trying to coax flour and water into a viable sourdough starter. I started with a mix of 100g Arrowhead Mills rye flour and 100g King Arthur AP flour and 200g lukewarm water. Marked the level on the jar with a rubber band, covered with a coffee filter. Fed at 7am and 5pm with AP flour, using a 1-1-1 starter, flour, and water ratio, discarding half the starter. Dropped back to 100gs each starter, flour, and water. I rigged a proofing box out of a styrofoam cooler and a light bulb, and it's keeping the jar between 74-80 degrees. There was rising/falling activity on days two and five. Hooch - or at least a separated liquid, appeared on days three, four, and five. The photo is from day two. Last few days no rise and fall, no hooch, and only small bubbles beneath a very thick skin formed on the top. It's like the kind that forms on pudding, only denser. Underneath that skin, the slurry is puffy and light, though it does not rise. It smells like fresh flour with a distinct but pleasantly earthy whiff of ferment. It tastes very tangy/vinegary and feels almost fizzy on the tongue. Is that skin on the top a problem or a natural phase? What could be causing it? Any adjustments I should make to feeding ratio, timing, or temperature? Thank you for your expertise and patience with a newcomer. Hi, I suggest you start with the pineapple solution, it worked great for me. after clicking on the link you kindly provided. Thanks, Barry! Ms. Wink's use of science in the service of sourdough, made fascinating reading. I didn't get to the end of the thread of comments and replies last night - only to Feb 2010 lol but that's my priority today. I gleaned that my starter might be at phase three, judging by her description. "The starter will become very tart --- an indication of more acid production by more acid tolerant bacteria. The gluten may disappear and tiny bubbles become more noticeable. These are signs heterofermentative lactobacilli have picked up the baton." I'll confess I have two starters underway, using two different protocols. Second starter, in the photo below, has the same behavior as the first. Looks like I'll have three once I get ahold of a can of pineapple. don't feed it for a day or so. Stir it down and wait. See what happens and report back. I've used either bottled or filtered water. I'll try not feeding the starter I've been feeding twice a day. It hasn't risen at all this morning, but that thick skin is evident. Here's a photo from this morning with the skin pushed to one side. Would you skim that off and discard it, or shove it down into the slurry underneath? well enough to discern if there are signs of activity beneath the skin.... If yes, skim off the skin, stir it and leave it alone for a bit. Make sure you have a really good seal so the moisture is retained. first of all, relax. It may take fourteen days even if all goes well so hang in there! What I get from your description: you absolutely fed too often. Twice a day is fine for a starter that is up and running, but not in the initial phase when all the beneficial bacteria and yeasts still aren't numerous and are trying to get going. I'm a big fan of the pineapple solution but I don't think you need to start over, you're well past the stage where that would have been helpful. 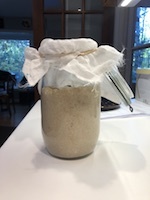 Personally, I would feed the starter rye flour only (because it's richer in the bacteria we want) until it's rising reliably, then you can switch to a mix if you want. The dry layer on top may be the result of the way you cover it - it could be simply dried out. Can you cover it with a lid or a plastic bag? Both yeasts and the sourdough bacteria are anaerobes, they don't need air! It's only that you need to cover the jar loosely so the pressure of the gas they produce can get out. Good job on the proofing box! Have a little more patience and you'll be there in a few days, I believe. Makes sense! I'll use their lids, not tightened down, just set on top. I started out using an old linen napkin, then switched to coffee filters on top. I had an uneasy feeling I was adding flour they didn't need or want. The poor organisms probably feel like they've been served Thanksgiving dinner twice a day for a week. I'd be napping too. With second starter, I've followed this protocol precisely. I don't know how good it is, but I've been consistent. Here's the homemade proofing box. Plus... Take a look at this thread. Advice will be the same for you. Best of luck! Gosh Abe, that was so helpful. It's my situation, more or less. All my problems, but with a happy ending. Progress today - putting on the lids and lowering the temperature in the proofing box a wee tad (from high 70s to low 70s) seems to have eliminated the skin on the surface issue. Starter #1 had myriad small surface bubbles, though no rise/fall. The others appear quiescent. I stirred all three, because yes, I could not resist trying the pineapple method just to see how it develops. Tomorrow morning I'll take photos of any changes. Thank you so much for that link! You were the soul of encouragement and calm patience. At 1 pm today - Starter #2 (Sophia) I'd left this alone, except to stir. At 1pm today - Starter#1 (Grendel, same goes, except I put it in a clean jar. Now I am a little scared to feed and water them, since I was probably smothering them with food before. What do you think? Another day of rest or jump back in? Following your advice to Giorgella, I fed starter 1-1-1 around 7pm. Nothing doing at 11pm when I went to bed.This morning at 6am, voila. Much excite! I took this photo at 11am with no sign of deflating, but now it's nudged down a smidge. Don't know if it's starting to fall in earnest, or If I jostled it when I moved it to take the photo. The next feeding at 7pm I'm going to discard excess and move to your suggested ratios of 1:2:2 - 20g starter + 40g water + 40g flour. What I don't know is whether to wait until 7pm, or until it has fallen back to the lowest level, or jump on it as soon as I am confident it's on the descent. Patience will be a priority for the next couple of weeks while I encourage the infant starters become robust toddlers. Starter #2 is just as floufy. ;D I thought I'd keep all of them going to bake and compare results. If this has been active for a day or two then why not give it another feed now and make it 1:2:2. If it reacts well and bubbles up with no issue in about 6 hours then onto 1:3:3. Save up the all the discard and make a bread with it with a touch of dried yeast. By the weekend or even Friday/Saturday you should be on track for a full sourdough bake. Can a starter give you side-eye? Fed Grendel 1:2:2 yesterday at 1pm, and no reaction. No activity by bedtime. This morning at 7am, still nothing and at 10am It looked like this. I'm thinking it's not dead, maybe not even sulking. Just in a food coma. I stirred it and set it back in the proofing box to await further activity. Sophia, the second starter, rose and fell, so I fed it and set it back in, and decided to experiment with the discard. Starter, water and AP flour instead of rye/AP, 1-1-1. I set it in a new location, the top of the fridge. It feels comfortably warm, and it's not enclosed, so unlikely to overheat. The pineapple/rye starter has a clean, faintly pineappley smell and it is just dozing in the jar, not yet awake. Va , what I find so contradictory is that starters can be hard to get going, but once you have them going, you will find they can tolerate a lot of abuse and won't die. Keep up with the good work. It is strange as once it comes out of the slumber they quickly gain in strength. It was certainly doing very well and it wasn't a great leap from 1:1:1 to 1:2:2. Grendel (starter #1) is still sleeping. No bad odor. Leaving her alone, except to stir, until something changes. On a more upbeat note, the other starter, Sophia, is chugging along. It’s been rising to double or more since Monday. I feed it once a day around 6pm: 25g starter, 50g rye flour, 50g AP flour, 100g water. It falls about halfway back to the baseline mark – maybe half an inch? Not sure exactly when it starts to descend, except not in the six hours after a feed. Maybe I have yeast gone mild, instead of yeast gone wild. Since that protocol is to feed once a day, I’ve just stuck to that. for fear of overfeeding. Thinking I should just rock along for another week or so before baking, so it can gain strength. Do you have an opinion on the relative difficulty of batard vs boule shape? I’d like to make two or three smaller loaves rather than one big round, mostly for ease of sharing. But if round is the way to go, I’ll stick with that. Many, many thanks for your patience. for flour and overfeed it too! By feeding it so much you have dliuted what ever kind of wee beasties you have, Stop feeding it until it shows activity and then only feed it once a day. Next time use rye flour only 30 g and 25 g of water and let it sit for a day then add the same amount of water and flour the next day, no discard, then let it sit again for 24 hours. The discard half and feed it the same 30/25 mix and let it sit a day . feed it again on day 4 and let it sit, On day 5 when you divide it in half make a levain with half of it for a loaf of bread on day 5 and feed the other half 60g of rye flour and 50 g of water after a half discard every day to keep as your mother starter but use the discard to make a loaf of bread. This method works every tie without ever failing and the way people used to make bread all the time when baking in a communal wood over once a week for that week's bread.. Rather than keeping a starter going all week they would just make a new one for that each week's bake . Everyone had a day to bake bread but the community baker would bake it for them and also make and sell bread every day for anyone who didn't want to make their own dough at home. Next time use rye flour only 30 g and 25 g of water and let it sit for a day then add the same amount of water and flour the next day, no discard, then let it sit again for 24 hours. Not sure the amount of starter you intended for that formula? The communal aspect of bread baking is one of the things that drew me to this site. Like the community bake - talk about inspiring! And, okay, a little bit intimidating. What is so cool is even though people are separated by anonymity and distance, they have a shared purpose that benefits everyone. Every great baker you see here stared out a newbie who made every mistake in the book too. We feel for your pain! My favorite way to make a starter is Mini's Ancient Whole Wheat Golf Ball in a Brown Paper Bag way. You just make a stiffish, say 66% hydration, golf ball size of WW dough and put it in a small brown paper bag that has enough white flour in it to cover the ball. Then close up the bag and put it on the refrigerator for 7 days and forget it. That's it. The gold ball will come out hard but when you cut it open the inside will still be moist, Scoop out the moist part and feed that 30/25 of WW and there you are a new WW starter! Another fun one is Joe Ortiz's whole wheat, cumin and milk one he did on Julia Child's TV show decades ago. It is fun to see it on YouTube today - just remember that at the time Joe, like most of the SD bread baking world at the time, thought he was capturing the Wee Beasties from the air instead of them already being in the flour as science has proved since then. What is the science behind it? Why do we have all this feeding, and maintenance when doing next to nothing works too. ...and why don't we advise everyone on this site to do the same? Or better still it could be a one recipe for everybody (worldwide) approach. Why are all these different recipes needed? the science is pretty simple. There are 2 kinds of we beasties both on the LAB and the yeast side. Some like to live in acid environment and some don't but both are in the flour - especially whole grain ones where they are dormant on the outside of the seeds where they like to hide out because that is their food source. One water hits the flour at the right temperature they all come out to play, metabolize sugars and replicate. Since all LAB make acid, the culture becomes more acidic. The acid resistant wee beasties on both sides thrive whole the others die out. As long as there is enough food to go around all is well and the good guys win put. Adding too much food keeps the culture from going acid so the bad wee beasties never go away. That is why an acidic juice like orange or pineapple is used in the beginning to keep the bad wee beasties at bay and let the good ones have more food and time to thrive and replicate. The starter I messed with the least is doing the best. creativity and innovation. I hope to be up to your speed someday. Just seeing my humble jar of gloop doubled this morning made me dance around the kitchen. Below is a really good explanation of the entire process. Note, by day 8 you have a starter. The problem is that you're underfeeding it. I don't mean not often enough. I mean the ratio of starter to flour and water is too low. The way to do it per the link below is after the initial feeding, you feed at 2-1-1 (starter-flour-water) for a couple days, then 1-1-1, then 1-2-2. This incremental increase in the food supply gives you a concentrated colony. Once the colony begins to take hold, the starter runs out of food at 1-1-1 feedings. Once the food supply is exhausted, the microbes feed on each other and all hell breaks loose. Note, starter that is doubling or tripling every 4-6 hours at 1-2-2 is ready to make levain. I'll bet you can bake within a day of 1-2-2 feedings. My builds are 1/8 oz-1/4 oz-1/4 oz. No need to waste flour. Awesome side-by-side comparison, and great visual documentation. Thanks Filomati! Hi, I just had exactly the same issue with my sourdough, and what happened is that the temperature you are using to proof it is way too hot (that's exactly what happened to me) after i put my starter in the oven to proof it, the next day it didn't rise or had any kind of activity, so i fed it again, and the next day it had that thick skin on top, but it wouldn't rise anyway, so what I did?! Took off that very thick skin and got rid of it, and feed it again just like normal, then next day again the thick skin was there so, did the same process again, and again and again but on the 3rd day i had thick skin on top, but it rose double in size, eventually after 4 or 5 days the thick skin finally stop showing, and my starter was back, healthier than before, just don't give up (I never put it back in the oven though) now i just put it in the hottest spot in the house and let it be, it takes longer but if you are patient you'll get a healthy starter, don't pay too much attention to the hours, because that can vary, like i live in Florida and in very hot days(as usual:) i would need from 4 to 5 hours max to proof it in the hottest room, but when the temperature drops from 5-10 degrees, it can take up to 12-14 hours so i have learned that with sourdough and baking in general it all depends on temperature, humidity, ambience and so many other things. to read you made the same mistake and it worked out in the end. Thanks. Putting caps on the jars and lowering the temperature solved the thick skin problem. Now that I'm seeing some activity I'm feeling very hopeful. Va , Congrats on how far you have come. The bad news, is that it gets more addictive as you progress - if you ask a 1000 bakers how they maintain their starters, you will get more than a thousand answers. Then when you get to using the starter - how many refreshes, how ripe , etc, you will get even more responses. Hope you enjoy the journey. After just a couple of weeks, starting innocently enough with let's ask Google how to make a sourdough starter, to zipping around various baking websites to compare methods, to watching youtube demos, to listening to the podcasts, and signing up with you good people ... yeah, I could be low-key addicted. I made a pineapple/rye version per your suggestion because I wanted to see how the different protocols compared. It's still in the quiescent phase. Now that I have a couple of jars acting right, I'm going to observe the rise and fall timing. Meanwhile, I'll look for a good recipe for beginners. Is tartine bread too ambitious? My plan is to bake every day or every other day for a while, figuring the best way to learn is to do, and give the (successful) loaves away. You are now a proud parent! I've never done a tartine loaf, but a good one to start with could be this Norwich sourdough. Or you could do a 1.2.3: take a look at some of the breads from the Community Bake here and see if anything rings your chimes. Brilliant! I'm starting to collect recipes that are geared to simplicity but still legit. I love the idea of making smaller multiple loaves in a batard shape because I like the size/shape for myself, and it should be easy to give them away. What do you think? Stick to the boule in the dutch oven as a beginner or go with batards on a baking stone and make steam? and give one away, using two rectangular roasting pans clamped together. She has other recipes that work well for me, being low-hydration and generally beginner-friendly. have you seen this recipe from Weekend Bakery? O findustry their instructions very clear and beginner-friendly. I came across this yesterday - love their dough calculator - and had just bookmarked the site. I could follow their instructions easily. I've been reading blogs and watching youtube videos, trying to get up to speed. Two weeks ago I'd never heard of autolyse. takes raw sauerkraut juice (lacto beastie galore, not canned or heat processed) and rye flour. Nothing fancy just a little bit of each and wait ... practically...bang! About 75°F+ temps. So many ways to get to where I want to go. Thank you. starting a starter takes one kind of feeding and maintaining a starter takes a different usually bigger maintenance feeding and more often. Depending on the temperature, starters that are growing yeast will need to be fed more flour than equal amounts when above 75° often twice a day. Let the starter peak and then when it starts to fall wait about an hour or two before feeding again. The timings will vary in the beginning. Waiting for it to go completely flat after peaking is too long a wait. Either give more flour or lower the temp of the starter for 24 hour feedings. At 75°F (23°) starter temp, the starter should be on twelve hour feedings with at least twice as much flour as starter. With warmer temps, feed more flour to get the starter to peak around 8 hours, waiting until about 12 hours to feed again. Generally feed more before the warmest part of the day. If temps fall off and drop lower at night, don't feed as much flour or skip the night feeding opting to feed in the morning or before temps rise again. Take note of the temperatures. That not only includes room temp, but favorite spot temp, flour temp and water temp. Write down dates and location even elevation. Unless you move around like me, elevation is a one time thing. Oh and don't forget to include the type of water used and flour type in the notes. What may help you is to taste the starter after feeding it, if it tastes like just wet flour, you have given it enough food. If still sour, add more flour and water. Sudden changes in starter behavior can be often pinpointed to seasonal changes (temp) or water changes (water treatment.) I keep a large water pitcher on the counter with a dish towel over it to use for starters and bread. ( but not in Austria.) Letting the water stand a day or two seems to prevent starter "sudden death" from chlorinated water. Typical signs of chlorinated water in the starter is usually a little activity only in the top centimeter of the starter where gases can be exchanged.